Regular membership is an annual membership. IVAA Memberships are non-refundable and renew annually. Are you associated with a college or other school that offers a virtual assistant certificate program? Contact the Membership Dept. to find out more about our College Representative member category. Click here to join as a Regular Member. If you are looking to test out IVAA and its membership benefits, a Trial Membership could be just what you are looking for. This membership type gives you access to a few of our most popular benefits so that you can check out what we have to offer. This one-time option is for a three-month membership (90 days) and costs $44. After your three-month Trial Membership has expired, you can upgrade your membership and become a Regular Member to receive all the benefits that IVAA has to offer. Click here to join as a Trial Member. Are you a student and pursuing an education as a Virtual Assistant? Starting your membership now while you are still in school is a great way to learn about all the resources that are available through IVAA to help get you started on the right track. Our Student Membership is valid for six months at a total cost of $37. This membership is renewable while you are pursuing your education. 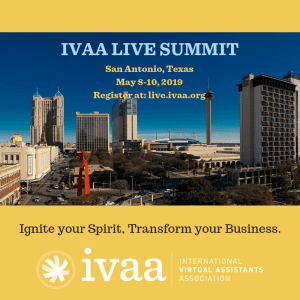 Once you are ready to start your journey as a Virtual Assistant, you can join IVAA as a Regular Member and receive all the many valuable benefits that this membership will provide on the way to your business success. Click here to join as a Student Member. We look forward to having you as an IVAA member! Still have questions? Please contact the Membership Dept.